Preheat about 2 inches of oil in a wok or large pan. Remove the pork belly from the plastic bag and use an absorbent kitchen towel to dab the meat dry with it. Keep the marinating juice. 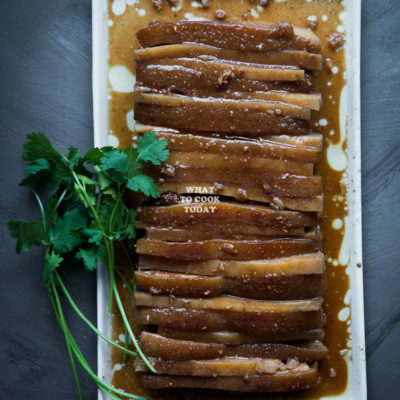 Gently place the pork belly, skin side down, in the oil and let it fry until golden brown and then turn to the other side and fry until golden brown. Remove and set aside. Fry the yam in the oil until lightly golden brown. Remove to absorbent paper towel. Slice the pork belly, about the same size with the taro, 1/2-inch thickness. You can try not to fry the taro, but they are easier to break after you steam them.